If you have always wanted to know everything related to fixing the components of your brake system this is the manual you should have. 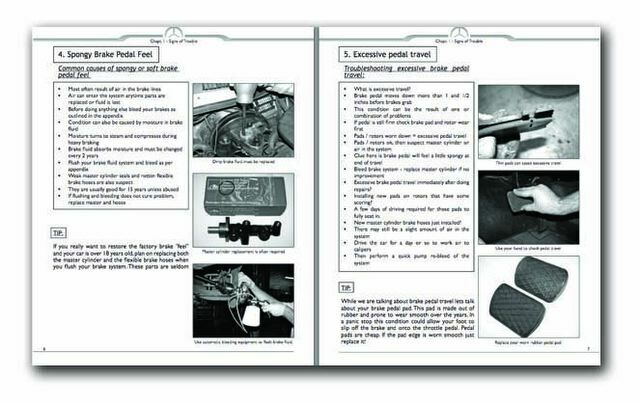 Some troubleshooting procedures and repair tips can not be found in any other manual - including the factory manuals. Loaded with pictures, tips, warnings and cautions. Even includes detailed information on troubleshooting rare and annoying brake problems, rebuilding brake calipers, setting bearing preload, as well as recommendations on easy wheel mounting on 200D, 230, 220, 220D, 240D, 250, 280, 280SE, 230SL, 250SL, 280SL, 350SL, 450SL, 450SE, 450SEL, 300SE, 300SEL, 300D, 300CD, 300TD, 300SD, 300SDL, 350SDL, 380SL, 380SEL, 420SEL, 560SEL, 190E, 1909D, 300E, 300CE 300TD, etc. Printed in an 8.5x11 format - 61pages and bound with a smudge resistant cover. We also offer a separate procedure manual on Brake bleeding, listed below in related products.